Our over achieving team has accomplished in a short period of time here at NIU; including clinching top positioned in almost all football Championships within Delhi NCR and the Northern Zone. We are very proud of their latest accomplishments here at the State Level. Any academic institution gains accreditation when its pillars, that is the faculty members are accomplished with adequate corporate experiences and competent learned capabilities for delivering and imparting the knowledge acquired. Noida International University (NIU) boasts a research oriented curriculum that would inculcate its students with efficient leadership qualities to make them industry ready and provides most resourceful, global and well planned lush green spacious and sprawling campus of 75 acres. Along with academics, students are provided with abundant corporate exposure, holistic knowledge and skill development opportunity to help them grow, plan career graphs and leverage in all spheres of life. Course years spent at NIU would truly prepare one for all entrepreneurial challenges ahead. Recreational clubs, world class sports facility, gymnasium and other activities also form a part of infrastructure at NIU. Noida International University (NIU), NCR’s largest private university with well-planned 75 acres of lush green campus offering more than 150 courses in 11 schools is inviting disciplined minds who possess certifications and proficient wisdom with desire to grow and excel in field of academics. NIU welcomes you to associate and enhance your career objectives by being a part of its distinguished global fraternity. Work culture at Noida International University is more of experiment based learning with a vision ‘to promote ecosphere of research driven education’. NIU has focused to remain at the forefront of learning, teaching and research since its inception. From time to time we at NIU look forward to hire skilled talent in domains of academic, research, administrative, technical and others across our local and global locations. Currently we have over 150+ faculty holding or pursuing their PhD degrees. Both our teaching and non-teaching staff receive annual increments, secure travel facility to and from university and all the benefits as per UGC guidelines. At Noida International University (NIU) students are provided with holistic development opportunity to grow in all spheres of life along with academic learning that would help them graph their career plans and leverage in corporate world too. We provide our students with in-house utility services like convenience store for their everyday household and grocery needs, banking and ATM services for daily financial needs and shuttle services to nearby hotspots. Apart from daily utility needs, NIU provides access to world class sports facility, gymnasium with latest fitness equipments, high speed Wi-Fi connectivity, comfortable and homely hostel accommodation and much more in 75 Acres of lush green spacious and sprawling campus. Noida International University (NIU) believes in providing global competencies to its students with pre-designed national and international study tours. NIU has been in constant endeavor to provide international exposure by signing MOUs with leading educational institutions across the globe. NIU also boasts a healthy relation across globe with students from over 21 nations enrolled. NIU offers more than 150 courses in 11 Schools with course disciplines related to Engineering & Technology, Education, Mass Communication, Business Managements, Architecture, Law & Legal Affairs, Science, Fine Arts, Liberal Arts, Nursing and Research Studies. Being situated in heart of National Capital Region (NCR) on Yamuna expressway, NIU has advantage of connectivity with the capital and maintains rewarding corporate relations with MNC’s providing industry interaction to students for course and career fit placements. 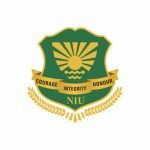 NIU creates an environment for students where knowledge and skill acquisition comes in concurrence with curriculum learning, leadership ability, self-confidence and other soft skill enhancement. Life at Noida International University brings forth the best in you and desire to lifelong learning with its research oriented education system.